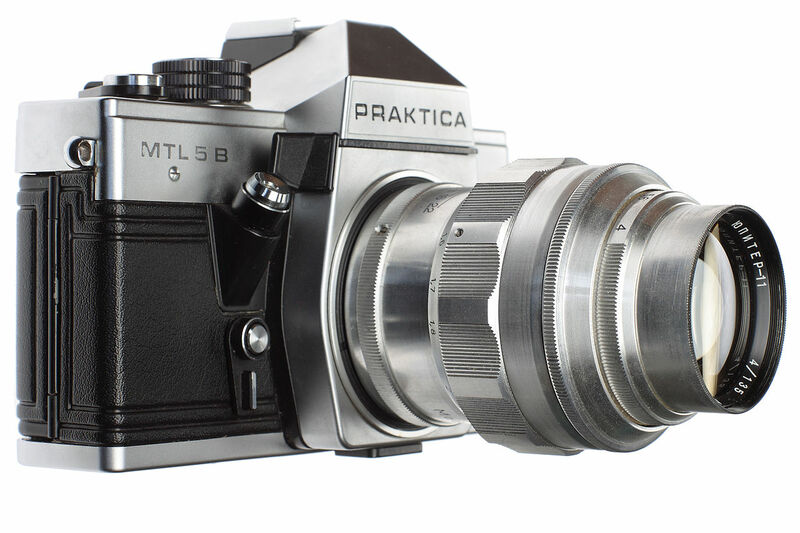 The Praktica MTL 5B is a 35mm SLR produced by VEB Pentacon in Dresden East Germany between 1985 and 1989. The MTL 5B is one of the Praktica’s long line of M42-mount SLRs, one which began with the East German-made Zeiss Contax S back in 1949. The M42 mount – made famous by Pentax’s Spotmatic range, amongst others – was non-proprietary, so many camera manufacturers used it, especially for cameras aimed at beginners and amateurs. Throughout the 1960s, Pentacon bought out model after model in their screw-mount Praktica range, including well-regarded models like the Praktica IV and the Praktica Nova. Prakticas were cheap and had few frills, but were well-made. 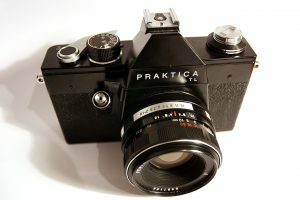 Sold at an artificially low price to earn foreign currency for the East German State, Prakticas became a popular with photographers who couldn’t afford designs from West Germany or Japan. In 1970, Praktica released the first of its L-type SLRs, the Praktica L. With a vertically travelling metal shutter, flash synchronisation at 1/125th and shutter speeds from 1 second to 1/1000th and B, the L was a budget model lacking a meter. But the L’s basic design – with some great ergonomic details like a front-mounted shutter button and its distinctive chrome-and-black-leather look – gave rise to a camera marque that would endure until the fall of the Berlin Wall nearly two decades later. The L was followed by Praktica SLR ranges like the VLC and EE, the latter adding aperture priority with Pentacon’s range of electric lenses. And in 1978, came the MTL 3, an updated version of the LTL which first appeared in 1972. Then in 1978 came the MTL 3. This updated LTL with a centre-weighted meter operated with a lever on the right hand side of the lens, just near the shutter button. The meter – powered with a Varta V625 battery – gave exposure readings via a needle in the viewfinder; pretty old hat by the time the MTL 3 came out, but more useful than no meter at all. The MTL3 was hugely successful – some 865,000 were made in its six years of production – and the basic design was revamped again in 1983 with the MTL 5, an essentially unchanged MTL 3 apart from some internal components. Again, this was a successful camera – more than 500,000 were made. Two years later came the MTL 5B. On the outside it was identical to the two earlier MTL cameras, though it did have one important difference – its meter was recalibrated to take the ubiquitous LR44 battery, used in a plethora of Western cameras. Introduced in December 1985, the MTL 5B remained in production until December 1989, when the fall of the Berlin Wall signalled the start of German reunification. During that time, some 567,000 were made, and many of them found their way into Western Europe. 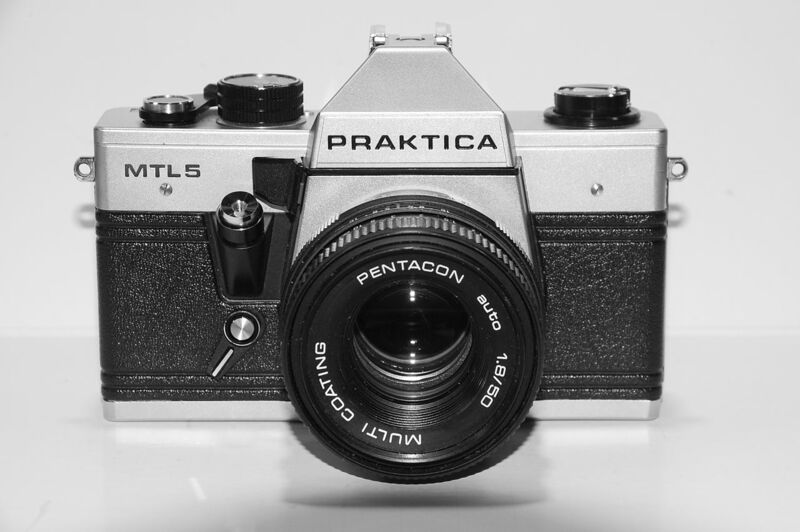 The MTL 5B retained the standard design of Pentacon’s Praktica L marque. 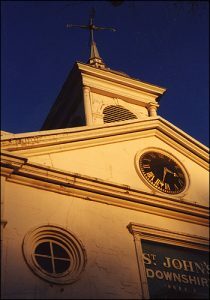 The shutter button sits on the right-hand side of the camera, just next to the lens and the metering lever. On the top right of the camera’s top plate is the shutter speed selction dial with the ISO selector inside it (ISO 12 up to 1600) and the plastic tipped wind-on crank and film counter, which counts up to 36. The camera’s ISO selector meters in one-third stops, which allowed photographers to use film intermediate film speeds like 125, 160 and 1000. On the left hand of the top plate is the rewind, a standard knob with a rewind handle. The L-type’s shutter was one of the hallmarks of the range; it’s incredibly reliable, reputed to be good for more than 100,000 movements; not far off 3,000 rolls of film. The only problem with it is the lack of dampening around the mirror which causes an enormous amount of noise. Prakticas were never going to rival Leicas and Contaxes for unobtrusive street photography. The MTL 5B usually came with one of four 50mm standard lenses – the f2.8 Domiplan and Carl Zeiss Jena Tessar, and f1.8 Meyer Oreston/Pentacon and Carl Zeiss Jena Pancolar. Of these, the Pancolor is the best of the bunch, a very well-regarded lens that can go for £100 or more on eBay; the Pentacon-marked lens is decent aswell. Hundreds of different lenses were made in the M42 mount; this means all manner of lenses, such as those made for Pentaxes, various Chinons of Soviet-made Zenits can also be used. The MTL 5B was the first ‘proper’ manual SLR I bought, way back in 2000. I got it for £50 from a camera shop in central London, with a Carl Zeiss Jena 50mm included. It was the camera that helped me learn how to properly expose a photo after a few years shooting on auto-focus Olympuses and Canons. 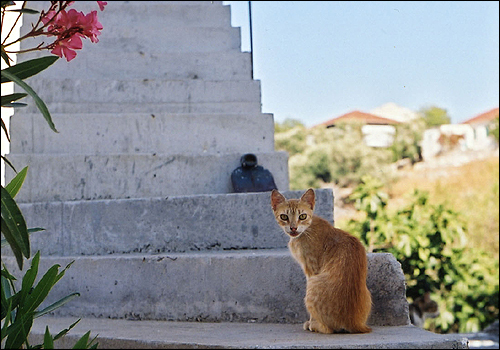 It went on a two-week jaunt to the Greek Islands where I snapped rolls after roll, and countless weekends wandering around London. After a couple of years I gave it to a friend who was travelling around India. The MTL 5B happily survived a few months of backpacking which brings me to another aspect of these cameras – their robustness. Prakticas were often derided for their lack of frills and solid size, but they are built like the proverbial brick outhouses. And with almost no fiddly electronics to seize up, many still have plenty of life left in them. Next articleWhat’s the world’s favourite film camera? Thanks for the message Morrison – I had no idea about this camera! Do you have a pic of one? Or links to it? Many thanks! I have a feeling that the MTL5 ( and variants) were the last of the M42 Practicas. 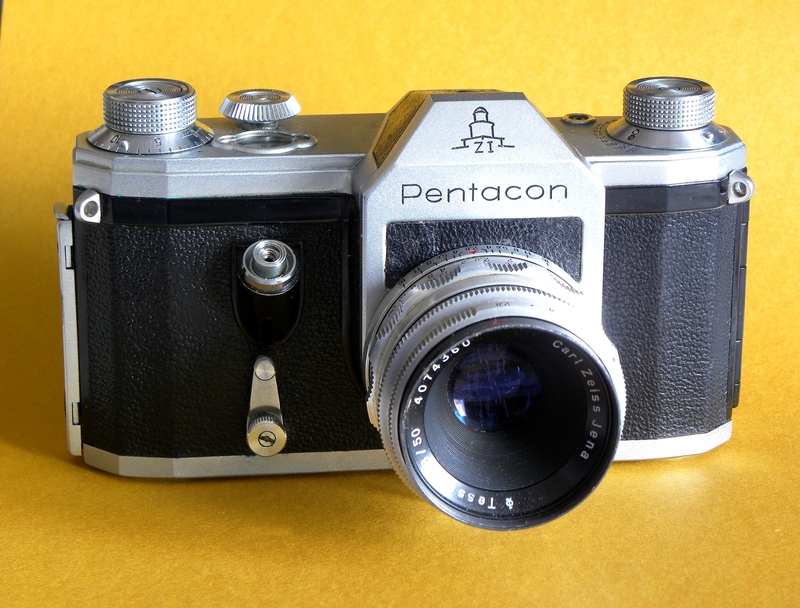 My first camera in 1980 was a PLC3, with Pentacon Electric coupled lenses, and luxuries like open aperture metering. Mine suffered a fall from waist height into a concrete floor, but suffered no ill effects, so I can vouch for the robustness.